The traveling public has many options for traveler information, including 511 phone systems, traveler information websites, and applications that can be downloaded for a variety of popular mobile devices (mobile apps). In an effort to understand the role that mobile apps play in the industry, the ENTERPRISE Pooled Fund Study researched traffic safety and traveler information apps published by private and public sector agencies. 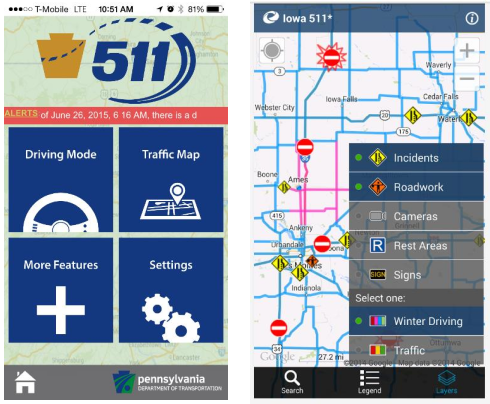 This ENTERPRISE project “Traffic Safety and Traveler Information Apps” focused on understanding two specific types of mobile device apps: traveler information apps that disseminate real-time information to help improve the mobility and safety of users; and safety apps that are intended to deter unsafe actions, such as inattentive driving. This final summary report for this project documents the features and functions of mobile device apps operated by many state and provincial Departments of Transportation (DOTs), as well as those operated by private companies. It is important to note that the functions and features of mobile apps are constantly changing and even as the report was developed additional features may have been added to the apps. In addition interviews were conducted with personnel from DOTs to help understand the motivation behind the development and operation of the traveler information mobile apps, and to understand the unique role these apps play in each DOT’s traveler information system.